MY PARENTS ONLY LET ME DO ONE ACTIVITY!!! I need your help! I made my soccer team and I’m sooo excited! But here’s the problem – I also want to audition for the upcoming musical at my school. I think I have a really good chance at the lead part in that! My parents say I can only choose ONE activity. I checked and the schedules don’t conflict, so I could totally do BOTH! I’m a great student, so I don’t get it. How do I convince them to let me do both?! Overscheduling – A lot of parents worry about their kids’ schedules being too full. They want you to have some free time for just hanging out with friends, doing fun stuff, and being with your family. Maybe you’d rather be at play or soccer practice, but your parents have their reasons for wanting things to be a bit more chill. And also, it’s not only about you. The more activities you have, the more stuff your parents have to keep track of, and the more driving around they have to do. Sometimes parents are expected to volunteer, which can be tough for them if they work outside the home. Grades And Other Responsibilities – You say you’re a great student, and I’m sure you are! But maybe that’s because you’ve always had plenty of time to get school work done. Your parents may worry that your grades won’t stay up if you have too many activities. It’s not just about time to do your homework, either. They don’t want you to be overtired, because that can impact how well you pay attention in school the next day. And it’s also not just grades – maybe you have household chores, or you’re responsible for walking the dog, or visiting your grandma every week or whatever. When kids neglect their responsibilities, parents are usually the ones who end up picking up the slack. I mean…who else is going to? So…I guess I’m saying I’m not sure you should try to convince your parents to let you do both. Because they probably have good reasons. You could try to have a conversation (no whining!) where you try to understand their reasons. And then, depending on the reasons, maybe there’ll be a way to negotiate. For example, maybe you can arrange a carpool to help you get to and from practice if they can’t take you. If you can’t change their minds, then you’ll have to make a choice. Maybe you do the musical and take a break from soccer if you’re more excited about the musical. Also! Keep in mind that you already made the soccer team, so if you don’t make it in the musical, you could always stick to soccer. 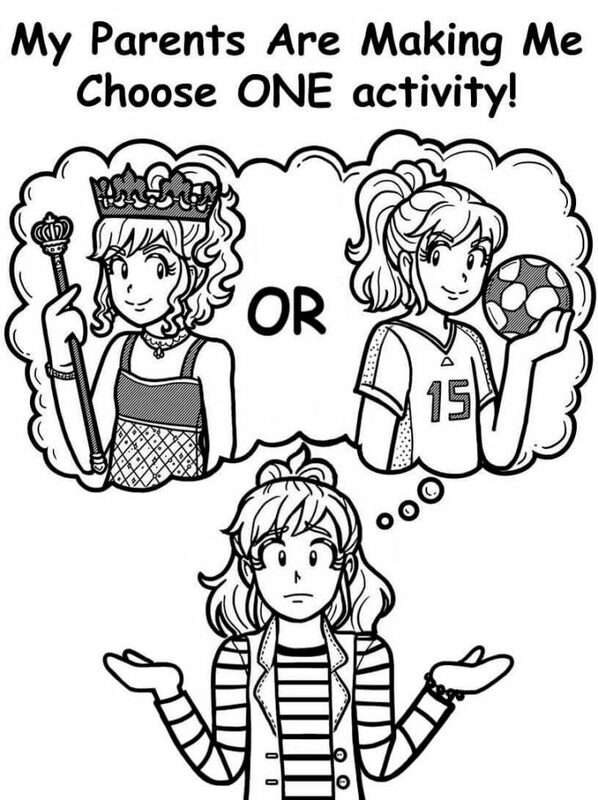 It’s a hard choice, and I totally understand wanting to be able to do EVERYTHING you want. Just remember that it’s not the end of the world if you can’t, and that there will always be next time! What activities are you involved in? Is it stressful? Do your parents limit your activities and if so, how do you feel about it? Tell us in the comments! Like Nikki said,even though you’re a good student,that can change if you have WAAAYYYYYYYYY to much stuff to do! And if you have chores,it’ll be harder to to complete it with so little time! hey nikki I absolutely adroe your books it really feels like were all a team knowing we understand each other I am talking to you and everybody reading this comment it is hard dealing with bullys its so aggravating when they call you names it especially wen they humiliate you and for the that have temper proplems I feel you I got them to and wow its wild im glad we understand eachother.